Team India skipper Rohit Sharma, who stepped up in the absence of Virat Kohli credited his bowlers for an emphatic win against Windies at the Eden Gardens. Meanwhile, Dinesh Karthik stepped up to share two crucial partnership after early hiccups to see India home. He remained unbeaten on 31 runs to secure a five wickets win for his side. Previously, the bowlers did an exceptional job to restrict Windies to 109 runs, after Rohit Sharma elected to bowl first. Kuldeep Yadav was the star of the show bagging wickets while chipped in with one each while being economical. Rohit Sharma credited his bowlers for putting up a brilliant show. He also noted that the conditions to significant effect. “Exceptional performance with the ball. Was a lot on offer for the seamers. Even with spinners, it wasn’t easy. Overall there was a little bit for every department. To start with, we bowled well – good areas. Used the conditions perfectly. Knew the chase wasn’t going to be easy. Hopefully, we can learn from these mistakes,” Sharma said. Furthermore, Rohit Sharma shared high praise for Oshane Thomas, who made the new ball count. He rattled Shikhar Dhawan’s timber with a peach of delivery despite his efforts going in vain. The Indian skipper praised him and wished him best for the future. “Oshane Thomas is a really exciting talent. If he bowls in good areas, it’s not going to be easy for batsmen to counter it. The advantage of height gives him that extra edge. Wish him the best in the future but not against us,” he continues. 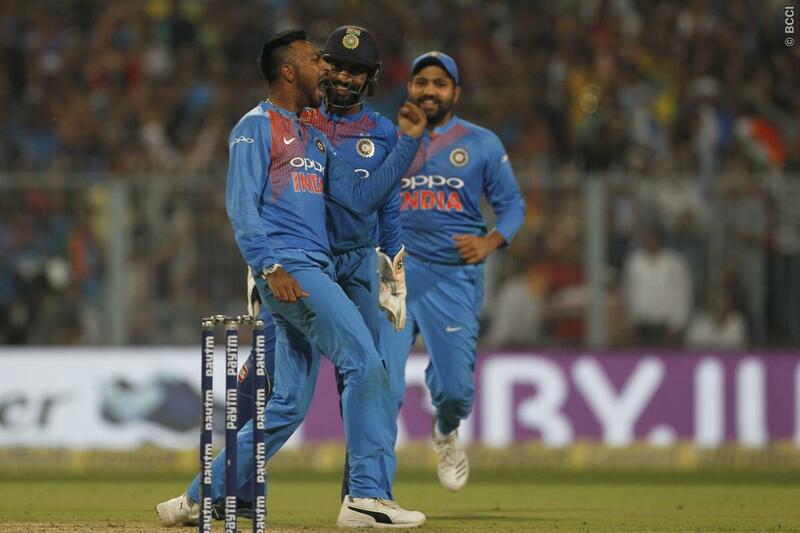 The men in blues skipper seemed excited with debutant Krunal Pandya, who picked the wicket of dangerous looking Keiron Pollard. Rohit Sharma feels India will benefit if they continue to perform like this. “Very exciting talents again – Krunal and Khaleel. Krunal – I’ve seen him closely in last two-three years for MI. When he came into bowl, Pollard was batting. He was the one who wanted to bowl against him. These guys are ready to take those challenges. Exciting for the captain when you see that. If they continue to work on their skills, India’s going to benefit for sure,” he concluded.